Jimmy Carter, Project Syndicate - Atlanta -- The world is witnessing a terrible human rights crime in Gaza, where a million and a half human beings are being imprisoned with almost no access to the outside world by sea, air, or land. An entire population is being brutally punished. Israel and the US refused to accept the right of Palestinians to form a unity government with Hamas and Fatah and now, after internal strife, Hamas alone controls Gaza. Forty-one of the 43 victorious Hamas candidates who lived in the West Bank are now imprisoned by Israel, plus an additional ten who assumed positions in the short-lived coalition cabinet. Regardless of one’s choice in the partisan struggle between Fatah and Hamas within occupied Palestine, we must remember that economic sanctions and restrictions in delivering water, food, electricity, and fuel are causing extreme hardship among the innocent people in Gaza, about one million of whom are refugees. Israeli bombs and missiles periodically strike the encapsulated area, causing high casualties among both militants and innocent women and children. Prior to the highly publicized killing of a woman and her four little children last week, this pattern was illustrated by a previous report from B’Tselem, the leading Israeli human rights organization: 106 Palestinians were killed between February 27 and March 3. Fifty-four of them were civilians who didn't take part in the fighting, and 25 were under 18 years of age. On a recent trip through the Middle East, I attempted to gain a better understanding of the crisis. One of my visits was to Sderot, a community of about 20,000 in southern Israel that is frequently struck by rudimentary rockets fired from nearby Gaza. I condemned these attacks as abominable and an act of terrorism, since most of the thirteen victims during the past seven years have been non-combatants. Subsequently, I met with leaders of Hamas, both a delegation from Gaza and the top officials in Damascus, Syria. I made the same condemnation to them, and urged that they declare a unilateral ceasefire or orchestrate with Israel a mutual agreement to terminate all military action in and around Gaza for an extended period. They responded that such previous action by them had not been reciprocated, and they reminded me that Hamas had previously insisted on a ceasefire throughout Palestine including both Gaza and the West Bank, which Israel had refused. Hamas then made a public proposal of a mutual ceasefire restricted to Gaza, which the Israelis considered and also rejected. All Arab nations have agreed to full recognition of Israel if it will comply with key United Nations resolutions. Hamas has agreed to accept any negotiated peace settlement between Palestinian Authority President Mahmoud Abbas and Israeli Prime Minister Ehud Olmert, provided it is approved in a referendum among the Palestinian people. This holds promise of progress, but despite the brief fanfare and positive statements at the peace conference last November in Annapolis, Maryland, a retrogression has occurred in the process. Nine thousand new Israeli settlement housing units have been announced in Palestine, the number of roadblocks within the West bank has increased, and the stranglehold on Gaza has been tightened. It is one thing for other leaders to defer to the US on the crucial peace negotiations, but the world must not stand idle while innocent people are treated cruelly. It is time for strong voices in Europe, the US, Israel, and elsewhere to speak out and condemn this human rights tragedy among the Palestinian people. 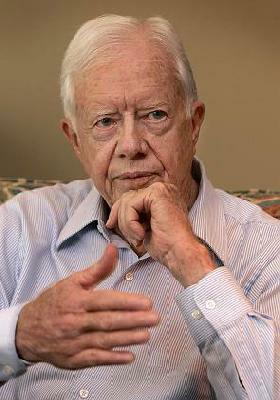 Jimmy Carter, a former President of the United States, is founder of The Carter Center, promoting peace, health, and human rights worldwide.